Bolchazy-Carducci adds another volume to its spread of intermediate Latin readers, which now number more than 20 according to its 1998 catalog. 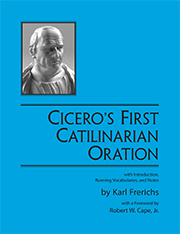 Frerichs’ Cicero’s First Catilinarian Oration follows the standard setup: brief historical introduction, facing vocabulary, additional help with the syntax splayed out under the text and vocabulary, a dictionary, and a brief bibliography in the back. The book is remarkably sturdy and ought to survive a couple of years of classroom use-important for public school adoption. A nice addition is a glossary of technical terms for rhetorical figures that make it easier to talk about the complex geometries of Ciceronian prose. A careful reading of the book uncovered only one typo. If I have a complaint, it is that Frerichs’ texts, notes, and vocabulary omit the macrons. Surely students will have to be weaned off of them sooner or later, but I would have preferred later. Perhaps a compromise position could have been to include macrons only on critical case endings, which look the same without them: the first declension ablative singular, for example. So much for the preliminaries. Does the book work? Do Frerichs’ notes help clear the way to an understanding and perhaps an appreciation for Cicero’s Latin? Frerichs is clearly well acquainted with the peculiar challenges of the intermediate class, where half the students are likely to answer ‘Dative?’ when asked for the tense of a verb and the other half is ready to revolt if they have to decline hic, haec, hoc again. The temptation to re-teach first semester Latin at each new word must be avoided just as much as its obverse of glossing over some real needs. The running vocabulary is generous-perhaps too generous. Chasing down vocabulary should be just painful enough to encourage students to try to think through their words before they start flipping pages in the dictionary . Precious little is learned about the form vacuefecisses, for example, if students can pick out vacuefacio and its translation just by moving their eyes a couple of inches to the facing page. It also makes class recitation more a matter of eyeball gymnastics than a demonstration, review, and reinforcement of what students are supposed to be learning about Latin. This is not a criticism of Frerichs specifically, but of the whole idea of abundant, facing vocabulary. (Perhaps Bolchazy-Carducci could be persuaded to include a complete, un-annotated text of the Latin for classroom work and tests at the end of their readers.) Frerichs’ syntactical notes are a skillful mix of hints, explanations, and brief translations of impossibly difficult clauses. As a way of preparing this review, I used his book in a second-year Latin class. My students were never without necessary help, but never were they overwhelmed. Even where his notes were not quite all that some of the students needed, Frerichs enabled them to ask intelligent questions about their problems. His historical comments, while necessarily brief, provided us with convenient points of departure for fuller class discussions. Frerichs’ text accomplishes precisely what a book of this sort should. I hope he takes time to write more of them. This video provides an overview of Karl Frerichs, Cicero's First Catilinarian Oration.